Vanderhoof is of course the band with Kurt Vanderhoof (Metal Church guitarist) on board. This outfit will later be named Presto Ballet (see an earlier post here). Truth be told, I don´t know much about the regular dayjob of mister Vanderhoof, but I like his side projects very much. And some more attention will not hurt. 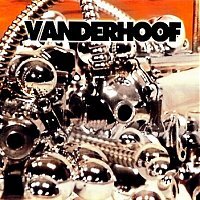 Vanderhoof is just like Presto Ballet firmly rooted in seventies music, from both progressive and hard rock origin. Think Hammond, guitars, melodies, and songs with depth and variation. Hence the progressive tag. The quality of the playing is without question and I would like to mention the sound of the drums, which is very natural and especially the kick drum has a lot of click in the sound which I happen to like very much. Although I feel that Presto Ballet is even more adventurous and perhaps in some aspects better (after all, they are older and wiser now), this is still a great album that easily withstands continuous play. So look out for it and pick it up. There are 2 albums under this name, this self titled and A Blur In Time. Very worth your money and time.